1. The plate is gummed up and thoroughly dried. 2. Image ink in the deletion area is washed off. 5. The deletion fluid is washed off with water and the tape is removed. desensitisation of the deleted area will be achieved if the plate is gummed up and dried before use. Traditionally the plate image was inked with black ink after processing. This improved image visibility to aid job identification, increased the oleophilic qualities of the image and protected it from the desensitising action of Gum Arabic. The modern presensitised plate does not require inking-in to improve its ink receptivity. Platemakers however do use inking-in solution on the processed plate to assist in job identification, and in many cases inking-in may be required to protect the image from desensitisation by gum. Positive-working plates may be susceptible to breakdown if exposed to light over a prolonged period of time. 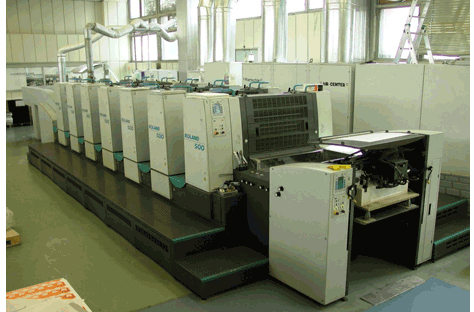 Inking-in solution is therefore applied to this type of plate by the platemaker and also by the pressman after the job has been printed to prepare it for storage. Inking-in solution is applied to the image in the following manner. 1. The plate surface is washed with water. 2. A small quantity of inking-in solution is put on a soft cloth or pad of cotton wool which has been damped with water. 3. Light rubbing of the image with the ink will now ink-in the image. This is a technique used by the pressman to prepare the plate for immediate printing. Wet washout is usually applied when the plate is on the cylinder and should be performed rapidly. 1 . The plate gum is washed off with water. The entire plate must be wetted. image to remove the inking-in solution. The plate must not be allowed to dry. 3. The entire surface of the plate is finally washed with water before starting the press and applying the dampers. The fluid contains a strong chemical which effectively removes the unwanted portion and desensitises the plate surface as well. The best deletion fluids do not damage the plate grain. A deletion fluid should be of tacky consistency so that when it is used on the press it does not flow down onto other parts of the plate.